GoviEx Uranium: Preparing to Meet the World’s Surging Demand for Uranium | Energy and Gold Ltd.
GoviEx Uranium is at the crossroads of two investment frontiers: The world’s surging demand for clean sources of energy, and the globe’s final investment frontier – Africa. GoviEx has four advanced development and exploration projects in Africa, amounting to an enormous total of 200 million pounds of uranium (measured, indicated, and inferred – measured & indicated categories total more than 120 million pounds). GoviEx can also boast an impressive list of investment partners including Cameco, Toshiba, Ivanhoe Industries, and Denison Mines. Continue to improve the economics of its African uranium projects, particularly its Madaouela Project in Niger, which boasts over 60 million pounds of probable mineral reserves U3O8. Advance its African uranium resource projects, beginning with its permitted Madaouela Project in Niger, to production as the world is moving from a uranium surplus to a uranium deficit. In a rising uranium price environment GoviEx arguably could become one of the most sought after investment opportunities in the uranium space due to its advanced development stage projects, major corporate partners, low cost structure, and relatively fast track to production. We had the opportunity to catch up with GoviEx CEO Daniel Major to hear the GoviEx investment story and his vision for the company over the next several years. CEO Technician: Please tell us about GoviEx and what you guys are up to. Daniel Major: The issue from our point of view is that we are in Africa, but we are holding one of the largest resources in any company in the uranium sector. The real issue for us is that you can get stuff done in Africa (permitting, construction, etc. ), in Canada and Australia it can take decades to complete these processes, whereas in Africa mines get permitted much faster. Niger has produced 8% of the world’s uranium for the last 50 years. 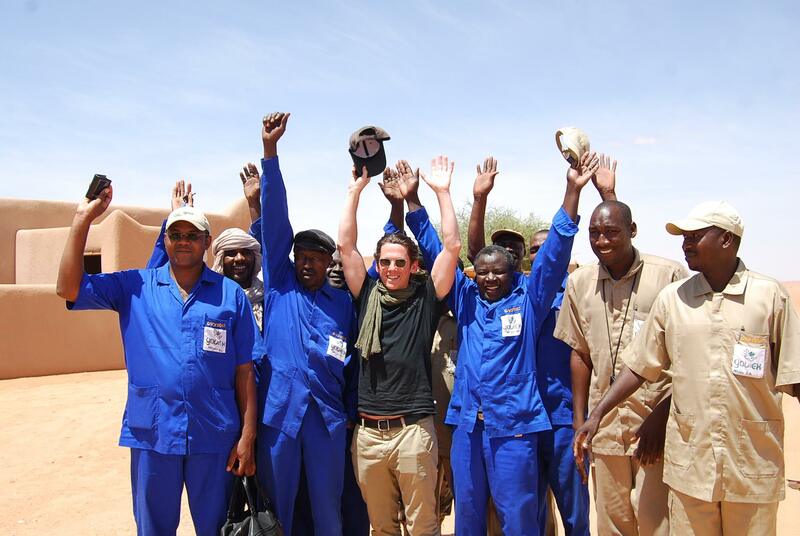 In June of last year in Niger we applied for a mine permit, and in January we received its approval. So Madaouela is shovel-ready subject to getting the capital funding, and in Zambia the Mutanga project, we’ve recently acquired from Denison, is mine permitted and also ready to be developed. In some places you can take 10 or 20 years to get to through these stages (environmental and mine permitting). In Canada that’s your timeline (10+ years). As this cycle starts to turn between now and 2020 it’s the projects like ours that are going to be helping to fill that supply-demand Gap. We’re targeting being in production by the time that this next cycle really gets going. GoviEx itself started in 2007; an opportunity arose in Niger as the government was looking to break up the cartel that Areva had on all the license areas. Ivanhoe was approached to see if they wanted to be involved because people knew what they had been doing in Mongolia and places like this. The business development officer at Ivanhoe at the time happened to be Govind Friedland and he said “geologically I understand this because all of the uranium that Areva has mined for the last 50 years has been sourced in the Aïr mountain range to its east and has basically been dissolved over time and deposited. These license areas are between Areva’s mines in the west and the mountains in the east so unless the uranium jumped across the license areas there’s probably going to be a deposit all the way in between.” So he agreed to acquire the exploration licenses and went on the road to raise the capital. Cameco became one of the first major shareholders in 2008. GoviEx turned the drill rigs on in August 2008. By 2010 we had drilled 400,000 meters, and completed a PEA, which showed we had 100 million pounds of uranium in the ground (roughly 50% measured & indicated, 50% inferred). The company at that point decided that it needed to start de-risking the resource and we started a major in-fill drilling program. In March 2013 we turned the drill rigs off after drilling over a total 600,000 meters, and outlining a resource on the order of 138 million pounds, of which 110 million pounds was in the measured & indicated category. CEO Technician: What are the economics like at the Madaouela Project and what is the estimated mine life and annual production? Daniel Major: Madaouela is expected to produce 2.7 million pounds per annum for 21 years. Initial capital costs are estimated at USD 359 M, total life of mine capital costs at USD 676 M, and cash operating costs of USD 24.49 /lb U3O8 excluding royalties, and USD 31.49 /lb U3O8 including royalties. Although I believe we can reduce those operating costs even lower. CEO Technician: Goviex has three significant African uranium projects. How did the company expand from Madaouela in Niger to Zambia and Mali? Daniel Major: We were looking to diversify into more than just our Niger assets and after looking around at projects in North America we realized the value simply wasn’t there for us to consider move outside of Africa (North American uranium assets carry much higher resource valuations than African ones). We were able to negotiate a deal with Denison Mines in which Denison was able to accomplish its objectives of divesting its African uranium assets while still having leverage to those assets while gaining additional leverage to our Niger asset. This deal closed on June 10th and now gives GoviEx three large uranium projects with more than 200 million pounds of uranium in total resources, and considerable exploration upside. Niger (Madaouela) is fully permitted, and that’s the one we really want to advance. Zambia already has a mine permit and they (Denison) already spent ±$50 million on the ground and technical work; it’s a very simple heap leach operation with low acid consumption. Then in Mali we have a smaller deposit (~32 million pounds) but it comes with a really high silver and copper credit; the indicated resource has a 72 gram/tonne silver credit and a 0.2% copper credit which is likely to help reduce forecast the unit costs. The unit costs for Falea are likely to be lower that those at Madaouela given it has a similar uranium grade but with the added benefit of the silver and copper by-product credits. We acquired resources with a lot of exploration upside, large known resources, and which already have had a lot of technical work undertaken on them (including mine designs, construction designs, metallurgical testwork etc.). CEO Technician: What are your target production dates for each resource? Daniel Major: At Madaouela we are targeting production in 2020, then 3 years behind that we are looking at Mutanga in Zambia (2023), and then 2-3 years behind that Falea in Mali (2025-2026). Scott Armstrong: Tell us about the exploration upside at these projects? Daniel Major: At each property we can drill out a lot more. In Niger for example, the structure we have been drilling is the same structure as the Areva mine (adjacent) and we haven’t connected the two properties. So there’s a lot of potential for us to expand around the two projects (Areva and Madaouela). CEO Technician: What is it like operating in these countries in Africa? In terms of royalties, taxation, labor, security etc.? Daniel Major: Mali is the 4th largest gold producer in Africa and our Falea Project is in the south of the country near the Senegal/Guinea/Mali border where there are a number of operating gold mines that have no security concerns. We are literally surrounded by gold projects in Mali, it’s a great location. Zambia is one of the most peaceful countries in Africa and it has been a major copper producer for a long time. I don’t think anyone has any concerns with Zambia. Most people’s understanding of Niger is that it has had its struggles. First of all, it’s a very large country – this is a country that is twice of size of Texas in terms of land area. 90% of the 17 million population live in 10% of the area to the south. We are way up in the north, in the Sahara Desert. Niger has had its issues as a country; between 2006-2009 the Tuareg people got fed up with the government profiting from uranium mining and were receiving insufficient benefit from it. So they rebelled. The government, with the help of the French, knew they needed to resolve this and come to a long standing resolution. The mining tax code was changed to clearly read that 15% of taxes generated from mining go to reinvestment in the north of the country. Moreover the Berber tribes have been fully integrated into the government and government structures. The Prime Minister for example is a Tuareg. Some people say it is a dangerous place to operate, however, there have literally been 2 noteworthy events in past 50 years (kidnappings in 2009 near Areva’s operations all of whom were subsequently released, and a car bomb after the French Govt went to help out in Mali in 2012). Frankly we find it to be an relatively easy place to operate, and we know how to operate there. In 2009 GoviEx promoted a policy of almost 100% Nigerien staffing, and the majority of the work completed to date by contractors in country, has been completed by Nigerien contractors. CEO Technician: Where is GoviEx at now and what are your plans for let’s say the next 12-24 months? Daniel Major: One of our benefits is that we’ve done most of the hard work. We’ve done a detailed pre-feasibility study, we’ve got a small amount of detailed engineering work for Madaouela and our focus now is on trying to secure the debt to be able to go out and build the mine. Our cash cost is $24-$25/lb and I still think I can get that even lower because there are a lot of synergies that we did not account for when we completed our PFS. The same thing with the capex, we are looking to see what kind of synergies can be achieved. We are surrounded by two other uranium mines so there is potential for cost cutting synergies there. CEO Technician: Tell us about raising the debt to build Madaouela, how does Goviex plan to go about doing that? Daniel Major: The approach we’ve taken rather than going to look for project financing is to reach out to all the major export credit agencies because they offer that sovereign protection that most lenders are looking for. The response has been very positive. So we are sitting with basically three offtake driven export credit agencies that we are working with; we’ve got China, Japan, and Europe. And then from a procurement standpoint we’ve got South Africa and Canada. Our target is that by the end of 2017 we will have put together the entire package that will be used to fund this project. On the offtake side because of this concern surrounding the supply/demand dynamic for uranium beyond 2020 people are already starting to talk about floor contracts for uranium at $50 or $55 per pound between 2020 and 2025. That is what we need to justify the project. So we are basically looking at running the debt financing program alongside completing the detailed engineering, alongside working on long-term offtake agreements. And as far as equity financing is concerned we are looking to place long-term commitments for offtake in exchange for equity. CEO Technician: Final question, and of course feel free to share any parting thoughts. Where is the value in GoviEx for investors and how much value do you see as available following one of the most brutal bear cycles than any sector has suffered? Daniel Major: Goviex is trading at roughly $0.10/lb in the ground whereas the peer average for developers is ~$1.00/lb. Meanwhile, most uranium developers haven’t even got their permits. We have two mine permits in hand and we see a relatively fast track to production in Niger. After virtually spending nothing on marketing and promotion for the last few years we see a lot of value in simply getting our story out there and letting investors know who we are. We’ve been so focused on getting on and doing our technical job that we haven’t put much into making sure that GoviEx was so well known by the market (GoviEx also didn’t have a public listing until 2014 when it listed on the Canadian Securities Exchange). We have delivered on every major milestone and promise to investors including getting permits in six months. Compare this to Canada where the fastest project to permit was Rabbit Lake and that took 7 years! Our commitment going forward is to get our story out there at the same time that we advance forward the mine construction package at Madaouela and target production in 2020 just in time for the cycle to have turned and be uniquely positioned to benefit from a rising uranium price environment. GoviEx’s valuation gap to its peer group (~$.10/lb U3O8 in the ground vs. ~$1.00/lb U3O8 in the ground amongst its uranium developer peers) makes its particularly intriguing from an investor vantage point. Either the market is correct and the risks of operating in Niger and/or the costs to build out the mine are simply too daunting OR there is a tremendous opportunity for investors to profit as GoviEx shares rise to bridge the valuation gap. Moreover, once GoviEx advances Madaouela to production GXU is ideally positioned to profit from a rising uranium price environment as its cost structure (~$24/lb operating cash cost, ~$37/lb all-in costs) allows for tremendous operating leverage as uranium prices rise north of $50/lb. If you believe that nuclear energy will continue to play a crucial role in our global energy future and if you believe that Africa is indeed the final investment frontier then GoviEx is a story worth closely following. After largely being forgotten during the doldrums of the last few years, GoviEx is uniquely positioned to fast track its large scale uranium projects to permitting and production at world class competitive cost levels (~$24/pound operating cash costs). We would like to thank Mr. Major for this time and applaud GoviEx for its move to the TSX-Venture exchange (GXU.V). Energy & Gold looks forward to hearing more from GoviEx over the coming months and we will be sure to provide readers with timely updates of GXU’s progress at its African uranium assets. The article is for informational purposes only and is neither a solicitation for the purchase of securities nor an offer of securities. Readers of the article are expressly cautioned to seek the advice of a registered investment advisor and other professional advisors, as applicable, regarding the appropriateness of investing in any securities or any investment strategies, including those discussed above. GoviEx Uranium is a high-risk venture stock and not suitable for most investors.. Consult GoviEx Uranium’s SEDAR profile for important risk disclosures. This article contains certain forward-looking information and forward-looking statements within the meaning of applicable securities legislation (collectively “forward-looking statements”). Certain information contained herein constitutes “forward-looking information” under Canadian securities legislation. Generally, forward-looking information can be identified by the use of forward-looking terminology such as “expects”, “believes”, “aims to”, “plans to” or “intends to” or variations of such words and phrases or statements that certain actions, events or results “will” occur. Forward-looking statements are based on the opinions and estimates of management as of the date such statements are made and they are subject to known and unknown risks, uncertainties and other factors that may cause the actual results, level of activity, performance or achievements of the Company to be materially different from those expressed by such forward-looking statements or forward-looking information, standard transaction risks; impact of the transaction on the parties; and risks relating to financings; regulatory approvals; foreign country operations and volatile share prices. Although management of the Company has attempted to identify important factors that could cause actual results to differ materially from those contained in forward-looking statements or forward-looking information, there may be other factors that cause results not to be as anticipated, estimated or intended. There can be no assurance that such statements will prove to be accurate, as actual results and future events could differ materially from those anticipated in such statements. Actual results may differ materially from those currently anticipated in such statements. The views expressed in this publication and on the EnergyandGold website do not necessarily reflect the views of Energy and Gold Publishing LTD, publisher of EnergyandGold.com.Accordingly, readers should not place undue reliance on forward-looking statements and forward looking information. The Company does not undertake to update any forward-looking statements or forward-looking information that are incorporated by reference herein, except as required by applicable securities laws. Always thoroughly do your own due diligence and talk to a licensed investment adviser prior to making any investment decisions. Junior resource companies can easily lose 100% of their value so read company profiles on www.SEDAR.com for important risk disclosures. It’s your money and your responsibility.